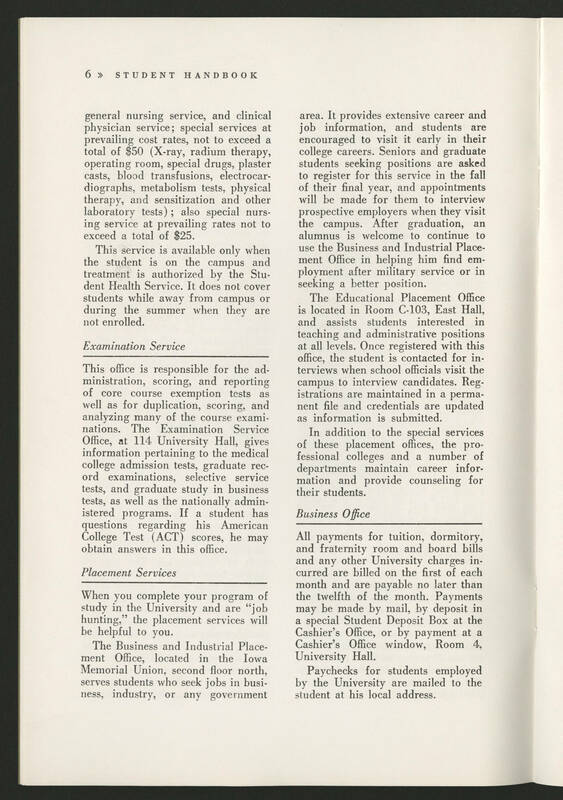 6 STUDENT SERVICES general nursing service, and clinical physician service; special services at prevailing cost rates, not to exceed a total of $50 (X-ray, radium therapy, operating room, special drugs, plaster casts, blood transfusions, electrocardiographs, metabolism tests, physical therapy and sensitization and other laboratory tests); also special nursing service at prevailing rates not to exceed a total of $25. This service is available only when the student is on the campus and the treatment is authorized by the Student Health Service. It does not cover students while away from campus or during the summer when they are not enrolled. Examination Service This office is responsible for the administration, scoring, and reporting of core course exemption tests as well as for duplication, scoring, and analyzing many of the course examinations. The Examination Service Office at 114 University Hall, gives information pertaining to the medical college admission tests, graduate record examinations, selective service tests, as well as the nationally administered programs. If a student has questions regarding his American College Test (ACT) scores, he may obtain answers in this office. Placement Services When you complete your program of study in the University and are "job hunting" the placement services will be helpful to you. The Business and Industrial Placement Office, located in the Iowa Memorial Union, second floor north serves students who seek jobs in business, industry, or any government area. It provides extensive career and job information, and students are encouraged to visit it early in their college careers. Seniors and graduate students seeking positions are asked to register for this service in the fall of their final year, and appointments will be made for them to interview prospective employers when they visit the campus. After graduation, an alumnus is welcome to continue to use the Business and Industrial Placement Office in helping him find employment after military service or in seeking a better position. The Educational Placement Office is located in Room C-103 East Hall, and assists students interested in teaching and administrative positions at all levels. Once registered with this office, the student is contact for interviews when school officials visit the campus to interview candidates. Registrations are maintained in a permanent file and credentials are updated as information is submitted. In addition to the special services of these placement offices, the professional colleges and a number of departments maintain career information and provide counseling for their students. Business Office All payments for tuition, dormitory and fraternity room and board bills and any other University charges incurred are billed on the first of each month and are payable no later than the twelfth of the month. Payments may be made by mail by deposit in a special Student Deposit Box at the Cashier's Office, or by payment at a Cashier's Office window, Room 4, University Hall. Paychecks for students employed by the University are mailed to the student at his local address.